GALERIE SUPPER is specialized in contemporary art. 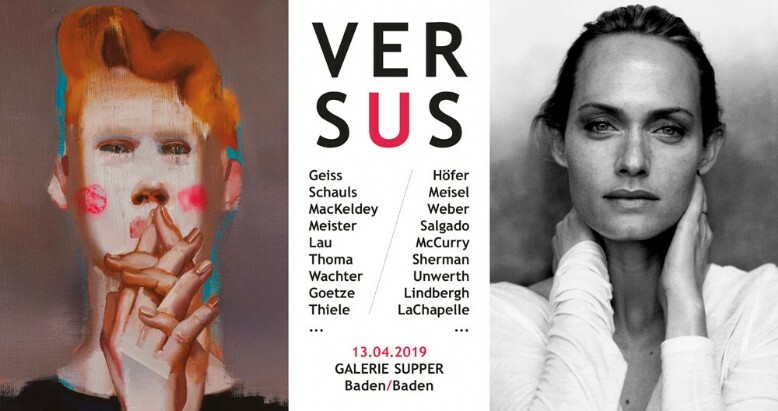 The exhibition VERSUS (13.04. - 06.2019) combines selected positions from the gallery's program with renowned contemporary photographers. Photography and painting have always had a highly ambivalent relationship. While especially in its early days, photography was said to be the "refuge of failed painters, of the untalented and the lazy" (Charles Baudelaire), it also did cause many painters to open up new horizons beyond the credo of realistic depiction. Mutual efforts of imitation and emancipation, as well as battles for the sovereignty of interpretation over the "real" and the "ideal", have been deeply inscribed into the evolution of both disciplines. VERSUS therefore confronts different traditional positions from the gallery's program with contemporary photography, staging duels whose victory will only be borne by the viewers. Guido Argentini, Gregory Crewdson, Ellen DeElaine, Patrick Demarchelier, Tino Geiss, Rayk Goetze, Candida Höfer, KEHL, Steven Klein, David LaChapelle, Andreas Lau, Annie Leibowitz, Peter Lindbergh, Mike MacKeldey, Steve McCurry, Steven Meisel, Katharina Meister, Thomas Ruff, Sebastião Salgado, Roland Schauls, Dag Seemann, Cindy Sherman, Stephen Shore, Monika Thiele, Ellen von Unwerth, Andreas Wachter, Albert Watson, Anja Warzecha, Bruce Weber.